One of the interesting things about the LTE eco-system is the number of parties involved in making it all happen. Surely one of the most interesting is Imagination Technologies, which has a piece of almost every pie in mobile. I recall Imagination Technologies as offering leading edge technology for the PC market in graphics and sound as far back as late late 90s, but as its ‎Senior Director of Marketing, David Harold told us, it has been concentrating on mobile since around that time – a decision it has never regretted, despite the concerns of those who thought it was misguided to turn its back on the PC market. With mobile rising and the PC market going the other way, it’s certainly had the last laugh. Perhaps its best known mobile win is the PowerVR graphics technology which helps to make the iPhone such a gaming powerhouse. However, just as its PowerVR offers efficiency in the graphics pipeline, it is also keen to promote is MIPS-based processor technology as a more efficient tech for LTE baseband tech in handsets and tablets.”A high performance, clean architecture” as it described it. The key is the fact that it is multi-threaded, makes for a big performance increase, and it claimed that using its architecture baseband manufacturer Altair saw a 30 per cent increase in performance in the same power envelope. It also has the likes of Sequans using its architecture. Imagination is also a key enabler of next-gen VoLTE, and its HelloSoft tech support SRVCC, and DRVCC for handoff between 2G, 3G and 4G networks. On the stand we also got a nice little demo of its RCS suite client, (see video below), which it said was currently in the process of receiving Joyn certification. While the jury is still out on whether Joyn will ever take off in any significant way, it was good to see it in action at least. 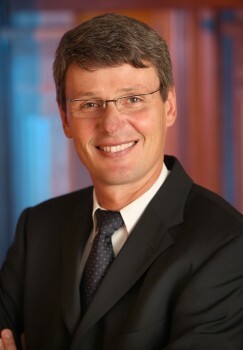 The new CEO of RIM - Thorsten Heins. Will the best LTE chipsets come to those who wait? So Mike Lazaridis and Jim Balsillie, the co founders of ailing Blackberry smartphone maker RIM, have finally seen sense and stepped down. It seems that they have finally done what everybody has been telling them to do for some time – get up, get out and get a clue. Whatever RIM has been doing over the past few years, clearly hasn’t been working, with the company losing market share faster than something that loses market share really fast, going downhill. Like Nokia. It’s a welcome move, but if we were being kind we have to admit that we don’t think that new boss Thorsten Heins has quite the charisma of a Steve Jobs – we can’t see him easily inspiring the troops to innovate it’s way out of trouble. If we were mean, and we’re not, we’d say he seems too conservative, too boring. Well, we’re a bit mean. He’s seems boring. What RIM simply needs is a hit, and with Apple and Android phones continually upping their game, not to mention the possibility of a resurgent Windows Phone powered Nokia, that’s going to be a tall order. The hope is that Blackberry 10 devices and PlayBook 2 updates will save the say, but as ever with RIM these are subject to delays. The suggestions are that RIM is waiting for new LTE chipsets from Qualcomm. On the face of it, there’s nothing wrong with that – after all, Apple doing the same. However, Apple is the second richest company in the world and its phones so successful it barely updated the last one and still had a monster hit on its hand. For RIM however, the clock is ticking. The problem is, the reasons to want a Blackberry are now smaller than ever. RIM came into existence on the back of email – a unique appeal that pretty much went with the introduction of the first smartphones. Then there’s the enterprise integration and security – areas the competition are making huge strides in. In fact you could argue that much of its continued success is from momentum of an existing customer base rather than any genuine technical advantages. I personally know of one IT department at a large law firm that is exclusively a RIM shop, investigating the competitors as an insurance policy in case its main supplier goes belly up, and I’m sure it’s not the only one. Then there’s its biggest remaining pull for many is from the “I have to have a keyboard” brigade – but my long held view is that this bunch are just stick-in-the-muds. The benefit of a smartphone is as an internet device, and taking up half its space with a keyboard virtually negates that; browsing on a Blackberry is unquestionably poor compared to a large screened iPhone, iPod touch or Android device. So can RIM actually afford not to get new product out there quickly? If it is goes early and chooses to go with HSPA devices, it will be seen as a lagging behind, even if Blackberry customers are not the ones who are likely to actually need LTE speed. It could go for the current LTE chipsets, but that would force even more design compromises, and negate battery life that is probably its one real boon over that of the iPhone and Android brigade. The face is that it’s caught between a rock and a hard place and in essence it is going to be forced to wait it out. And while Apple can bide its time, and use it to further improve the iPhone 5 or count its stash of cash, RIM will have to just cling on, and hope that when those suitably downsized, power efficient Qualcommm LTE chipsets finally appear, there’s still a company to make use of them.